This was going to be a straightforward garden update with some notes about what seems to be working and not working for me. But that changed thanks to yesterday’s weather. 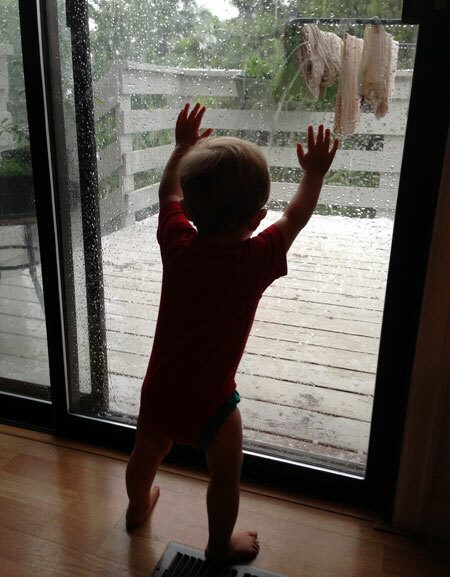 Theo watching the hailstorm — it hit so quickly I didn’t even have a chance to pull the rack of drying diapers inside the house. We had a massive thunderstorm that sat over our area for close to 12 hours, dumping massive amounts of rain, hail and maybe even a lightning strike a block away. 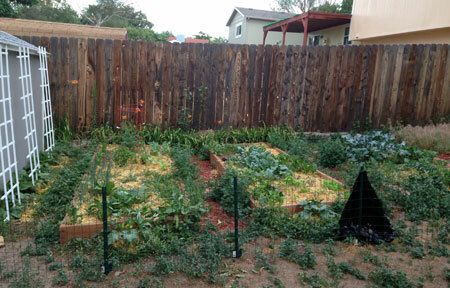 The garden, needless to say, was pretty well flattened, and even some of the mulch around the beds got washed away as water poured downhill in my backyard. I am honestly not sure yet which plants will survive and which will be seriously delayed in growth, but it looks pretty grim at the moment. So some of these shots will be before-and-afters. Popcorn and pumpkins here. One of the pumpkins is a start, the others are sprouts from seed that I had just about given up on (hence purchasing the start). My little fence-side beds are mostly not doing so hot. Freyja likes to sit over there, so she flattened all of the sunflower seedlings except for one in the corner (and my mom pulled that one while volunteering her time weeding this week, unfortunately); the delicata squash I planted in front of the sunflowers never sprouted, which I think was a combination of the dog walking on them, lack of water retention in the soil there, and possibly too much shade. The bed with the asparagus crowns, lovage and rhubarb did nothing at all; I think the crowns and bulbs were already dried out by the time I planted them, and the lovage seeds didn’t get enough water early in the season. 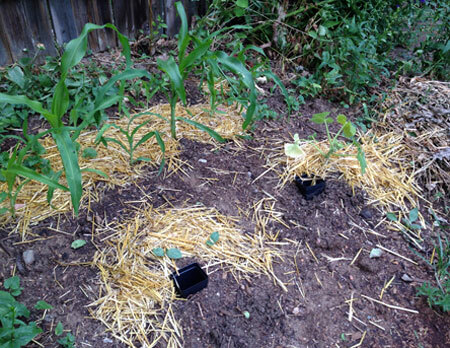 Some of the popcorn also got dog-stomped, but I had enough seeds to replant, and they have been doing quite well. I replanted squashes several times in this area, and finally got some Dickenson pumpkins to sprout; so far a Jack Be Little pumpkin start is also surviving here. The herb spiral is doing pretty well. I am getting some soil run-off, so I think next season I should probably build up the base wall a bit higher and supplement soil. The spiral isn’t completely full, but I ran out of money to buy plants; I am planning to fill this with more hardy perennial herbs over time. 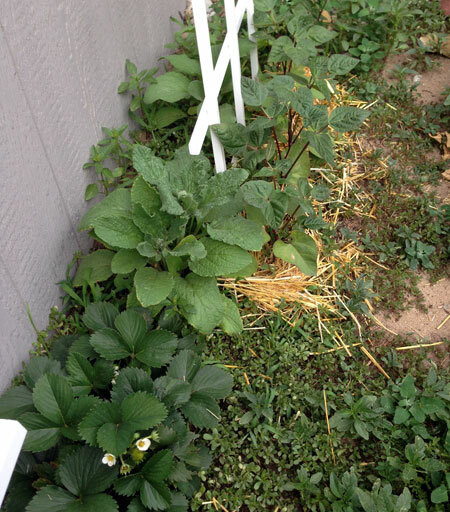 Strawberries and borage with pole beans alongside my shed. The pole beans are coming up pretty well, and are nearly tall enough now to reach the trellises I put up for them to climb. 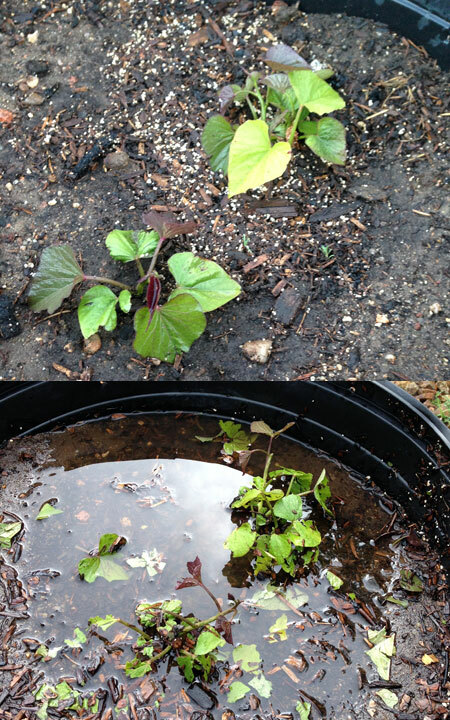 My strawberry plants are getting nice and big, but they don’t seem to produce a lot of berries. I’ve gotten just one or two small ones and shared them with Theo standing in the garden. The borage is getting ready to flower, and I am looking forward to adding that to salads, and maybe infusing tea or kombucha with the leaves. 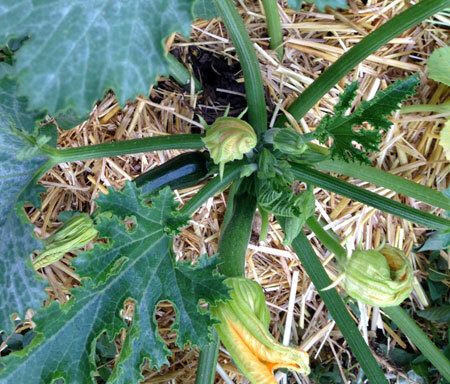 At the front of the left-hand bed, my Black Beauty zucchini has been doing well and just starting to blossom and develop baby squash in the last week. It is much happier since I mulched, and no longer wilts so much in the afternoon sun. Inside the bed, arugula is growing well but starting to bolt. Icicle radishes and turnips are also starting to bolt; I have been harvesting them but most are much more leaves than roots. Fortunately, the leaves are edible and nutritious, so I don’t count this as a big loss, but am wondering what they are missing for more robust root development—fewer, deeper waterings? My onions are doing well so far, and the ground cherries I planted from seed have sprouted and surpassed the indoor starts in size; a few are even starting to bloom. 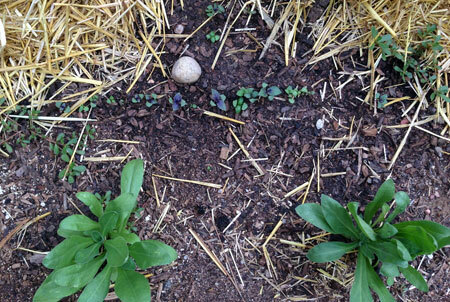 These calendula and basil plants are growing alongside my tomatoes, and are supposed to be good companion plants. I also have some basil starts, but they have been struggling ever since I put them in the ground and I pull off blossoms every time I check the garden, so I am hoping the seedlings will be more robust. I finally got the tomato cages up, which wasn’t too easy with a few plants because they were getting big. My nasturtiums, also companions for tomatoes, are growing well here, but I have had a very hard time keeping cucumbers and beans alive for some reason. All the cuke seeds I planted would sprout and then shrivel up, so I finally got starts and have been watering them like crazy; somehow I had one cucumber seed migrate right under one of the tomatoes and of course that one seems to be doing well, so I’m just leaving it to see what happens. The dragon tongue beans in this area keep sprouting and then turning yellow and dying. I have replanted several times with no success, and am trying to figure out what they need to be healthy. 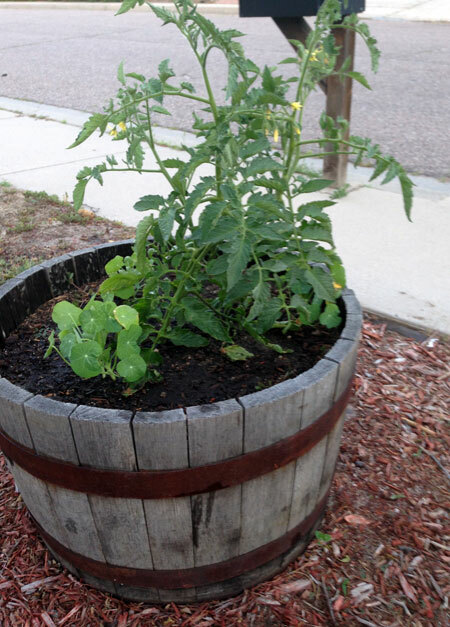 The folks at Phelan Gardens said they have heard of other people with my soil mix (the one from Don’s Garden Shop) having similar issues, and suggested amended with sheep and peat and using some liquid fertilizer, plus top-mulching with straw to retain moisture. I think it did make some difference, but the whole situation just puzzled me because I thought legumes were pretty unfussy to grow and put nitrogen and stuff back into the soil, so I did not expect them to give me so much trouble. I also lost a lot of garbanzo beans in this bed. 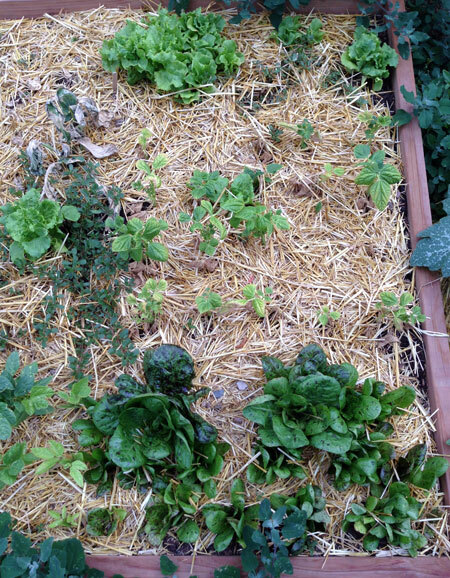 In the middle bed, I have two kinds of lettuces that are doing well despite the heat. 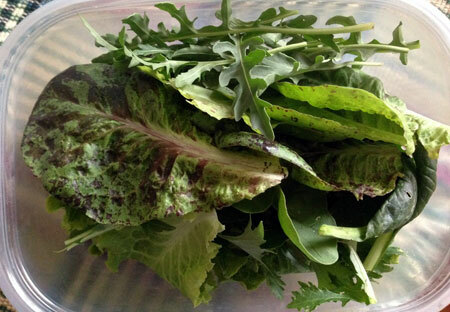 The Freckles lettuce in the bottom of this photo is gorgeous, mild flavored, and has nice big leaves with no sign of bolting. The Black-seeded Simpson in the back looks a little weathered from the heat, but is also holding up nicely, if not growing as vigorously as I anticipated. In the center you can see a patch of calypso bush beans that are also struggling; they are faring a bit better than the dragon’s tongue beans, but still have pretty stunted yellowing leaves. To the left, mostly out of sight, I have a long row of purple hull peas, most of which are doing alright, but they seem to be growing slowly as well. 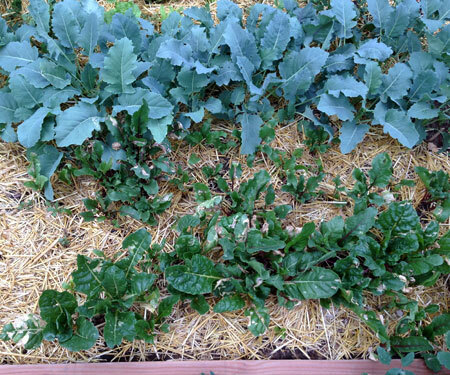 The healthiest plants in this entire bed are my kohlrabi plants. I thinned and transplanted a bunch of them last month, and every single one survived the move, so I will have more kohlrabi than I know what to do with soon. 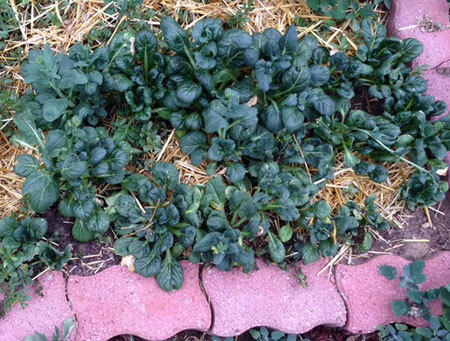 Some of the plants are starting to form little bulbs at this point, and all of them have lovely foliage. I wish I could say the same for my chard and beets, which are getting eaten alive by leaf borers. I can see the eggs on the back of the leaves and have tried manually scraping and spraying with homemade insectidal soap, but that has done very little to slow the damage, so I haven’t been able to harvest much from these plants. The beets were thinned and transplanted at the same time as the kohlrabi, but most of the plants were unhappy being moved, so I lost quite a few of them (very different than my experience transplanting beets from our home garden to the community garden plot a few years ago). Hopefully the survivors will at least form good roots, and I hope to start replanting for a fall harvest in the next week or so; I am told that leaf borers are less of a problem in the fall vs. spring. 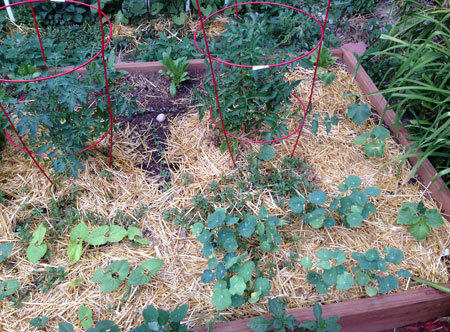 I also grew peas and spinach in this bed; the peas died and the spinach bolted before it was big enough to eat. 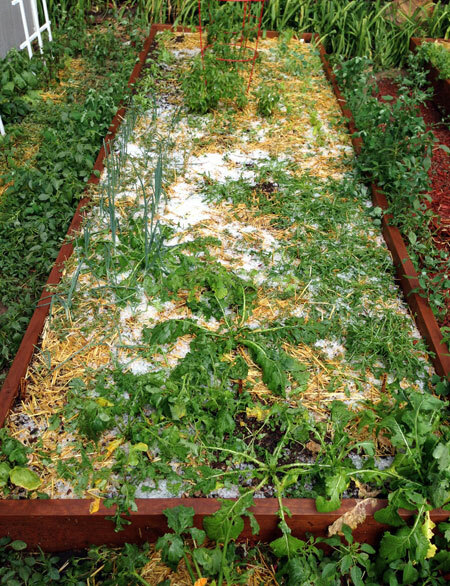 I also have some interplants of carrots and radishes that are hanging in there, and a square foot of mesclun mix that seems to have transplanted itself as volunteers all over the bed. Tatsoi or spoon mustard is one of my favorite types of greens. It is delicious raw or cooked, and looks beautiful in the garden. These plants are bolting like crazy in the heat, however, so I will soon need to pull them out and replant for a fall harvest. This third bed is mostly cole crops, and they are all thriving, more so than anything else I have grown. 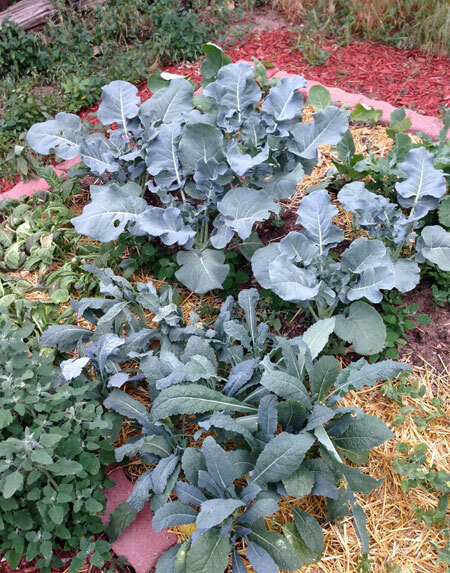 Here you can see Packman broccoli and Tuscan kale, with red mustard, collard greens and rutabagas mostly hidden behind them. 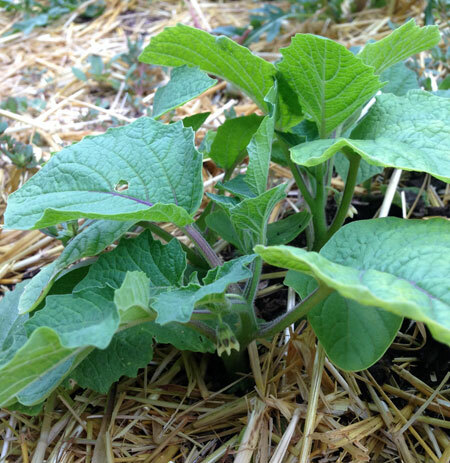 This giant red mustard is another of my favorite greens to grow. 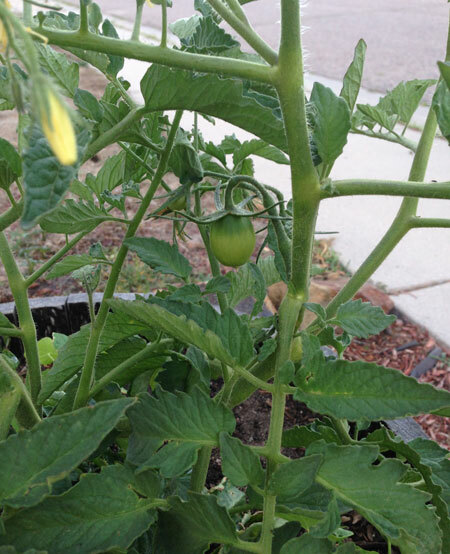 It grows quickly, has lovely coloration, and a good mild flavor. 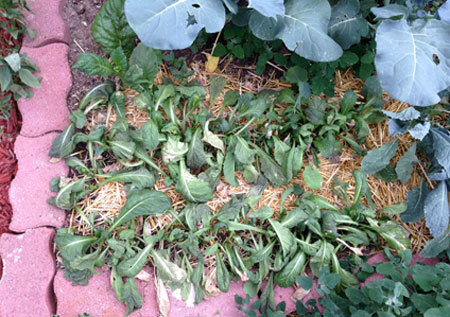 This patch is pretty much shot from the heat, wilting and bolting, and has been hit a little bit by insects as well; it is time to pull it out and replant for fall. 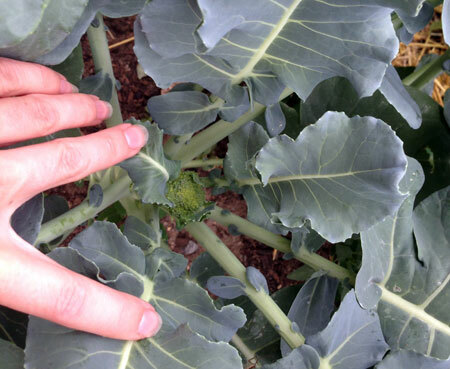 My broccoli is just starting to form tiny heads—so exciting! 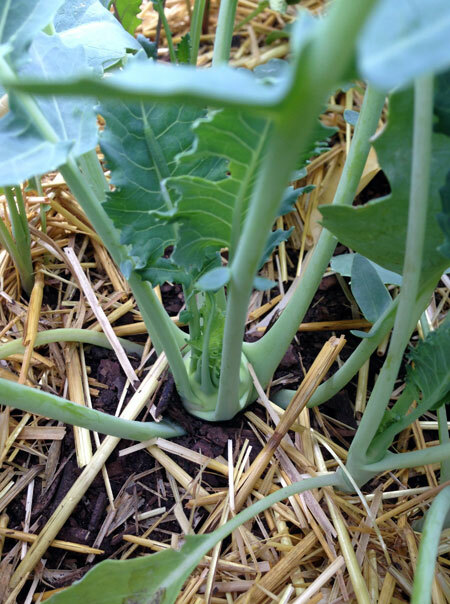 I also have a few savoy cabbage plants in this bed that are holding their own. The collards are doing well, and it looks like the rutabagas are mostly going to bounce back from the thinning and transplanting I did last week to give them more space. 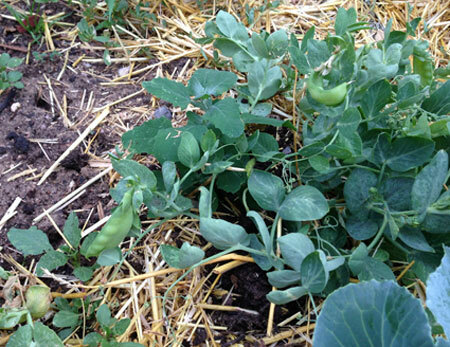 I am finally starting to harvest a few snow peas. Half my plants died and the rest had pretty meager growth, much like the other legumes; my shelly peas all died, even after replanting, so this is all I was able to keep alive. Some of the pods were nibbled on also; I have seen a mouse in the beds on several occasions, so I think that is the culprit, although I’m not sure if there is anything I can do about him. 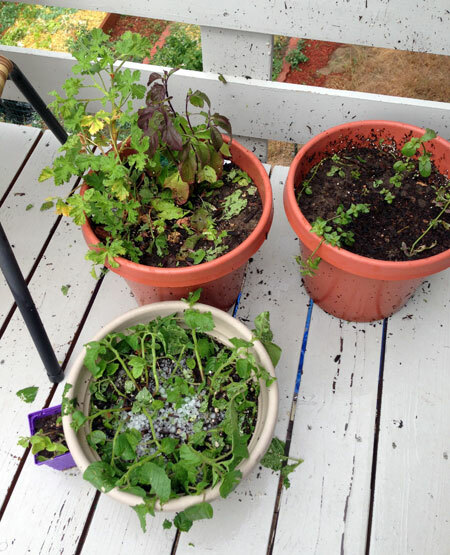 These are a few of my back porch pots after the big storm: at bottom is a bunch of mangled ground cherries; above them is a pot with holy basil and apple-scented geranium, and a pot of chocolate mint. 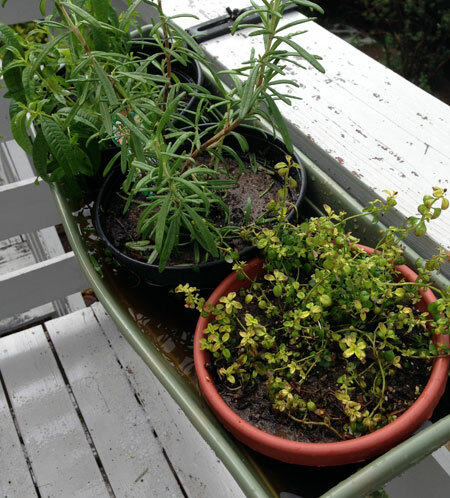 My porch rail herb garden mostly survived the hail, but got totally flooded with rain. 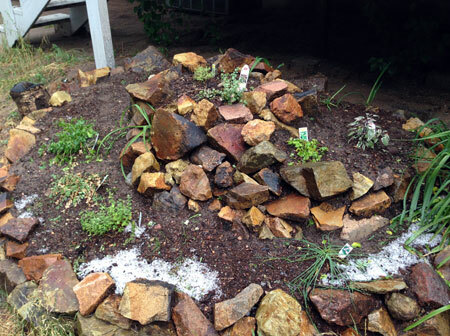 Here you can see thyme, rosemary and lemon verbena sitting in a little lake. 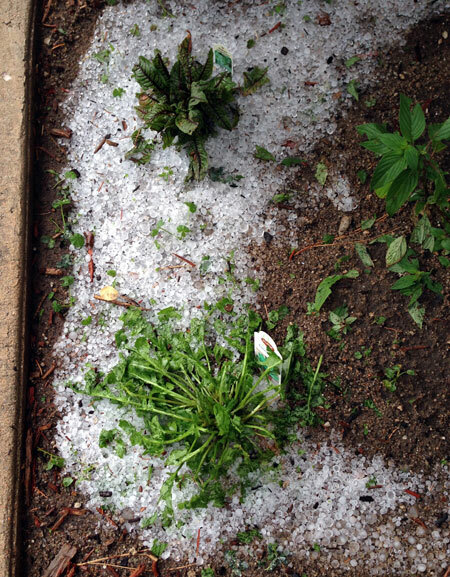 The rest of my front yard plants were pretty severely hail-damaged too, but I don’t have as much actively producing harvestable foods here yet. It looks like this big Amish paste tomato plant survived the hail mostly intact. It has been doing the best of any of my tomatoes, and it does have a cage on it now for support. I’m not so sure the Black Prince tomato on the other side of the driveway will fare so well though; it lost a lot of foliage.